Whether you have restored a tooth with an amalgam or white composite filling, or upgraded your look with a cosmetic procedure such as bonding or porcelain veneers, there are some simple steps to follow post-treatment. 1. Composite fillings are fully hardened by the time you leave the office. You can eat as soon as your freezing wears off. Amalgam (silver) fillings take a few hours to harden so we recommend you chew on the opposite side of your mouth for at least 24-hours after your treatment. 2. During your appointment, we will work with you to ensure your bite is comfortable and correct. It may feel different post-treatment, but as long as your teeth come together while biting, we recommend you give your mouth some time at home to adjust. It can take a few days for your brain to recognize the new feeling or positioning. The initial bite check is done while frozen and this fact can sometimes alter what feels right. Once the anesthetic comes out, if you find the restored tooth is touching before any other teeth, call our office and we will arrange to adjust it for you. This is a quick fix that won’t require freezing. 3. Dental work can cause reversible pulpitis, which means that the nerves in your tooth are temporarily inflamed and hypersensitive. This sensation will pass, but it may cause sensitivity to hot and cold substances and can take some time to heal. Your gums will also be affected by the treatment and may feel raw and sore. You can manage any discomfort with a warm saltwater rinse (a teaspoon of salt in a cup of warm water) three times a day and a mild pain medication (one tablet of Tylenol or Ibuprofen every 4-6 hours). If these pain medications do not help with your pain, please contact our office so we can properly assess your situation and prescribe appropriate prescription medication. 4. Minor side effects may include an increase in salvia while your brain is adjusting to the new size and shape of your teeth. Your speech may also be slightly affected. Don’t worry! This is a completely normal reaction and things will return to normal in just a few days. 5. Even though your mouth may be sensitive, it’s imperative that you continue to brush and floss your new dental work. There is nothing stronger than a natural tooth, so once there has been any dental work completed, it needs extra care and attention to last as long as possible. Fillings are more susceptible to cracks or chips caused by hard foods such as nuts, ice, carrots and candy, for example. Smoking, coffee, red wine, tea and berries can stain your new teeth so we recommend you avoid or minimize their intake. 6. If you play sports, let us know! It’s our policy to provide you with a custom-made mouth guard. Your only cost is to the dental lab that fabricates the mold; our service is complimentary. 7. Extra pressure on dental work can alter its lifespan. If you grind your teeth when you sleep, make sure to wear your mouth guard or have one custom-made. It may take time to adjust to the feel of your new smile. But it’s well worth the wait! If you have any problems or concerns, please call us directly to walk you through the process. There are two steps in having a crown or bridge placement. In your initial visit we take a mold of your mouth and forward it to a dental lab to prepare your bridge or crown. In the meantime, usually two weeks, we place a temporary crown or bridge on your tooth to keep it protected until the final restoration is ready. Your mouth will be frozen so you should refrain from eating or drinking hot substances until the numbness subsides. It’s very important to keep your temporary crown in place as it prevents your other teeth from moving and altering the fit of your final restoration. For best results, avoid eating sticky or hard foods and eat on the opposite side of your mouth. Continue to brush and floss daily but take extra care on the temporary crown so it does not dislodge. If your temporary crown comes off, call us immediately so we can re-cement it. Once your final restoration is ready, a crown or bridge placement will take approximately as long as a filling and you may experience similar sensations post-operatively. There may be sensitivity to hot and cold and mild pain around the dental work. If there is a random pain without any trigger, there may have been deeper damage done to the tooth. Call us so we can assess your situation and diagnose whether you need additional treatment or pain medication. If your bite feels uncomfortable, if you have ongoing pain, or if you have any other concerns, please call our office. Once the tooth is pulled, we’ll have you bite on a gauze for 20 to 30 minutes to form a blood clot and stop the bleeding. If your wound continues to bleed or ooze, replace the gauze and bite firmly for another 30 minutes. You may need to repeat this process until the bleeding completely subsides. It’s important to make sure the blood clot remains undisturbed so healing can begin. We recommend against any oral activity that could aggravate the wound. Refrain from heavy rinsing, sucking on straws, smoking, drinking alcohol or brushing next to the extraction site for 72 hours. Any of these things could puncture the wound, resume the bleeding or cause an infection. We may also recommend limiting vigorous exercise for the next 24 hours as it can increase blood pressure and cause more bleeding in the wound. It is normal to feel some pain and swelling after a tooth extraction. Using mild pain medication and icing the extraction site with an ice pack will help keep discomfort to a minimum. Symptoms usually subside after 48 hours. If we have prescribed antibiotics, take them to their full duration to ensure all infection is gone, even if you are feeling fine. Drink plenty of clear fluid and nutritious soft food on the day of the extraction. After the procedure, try to eat on the opposite side of the extraction site for 24 hours, or until it has healed. You’ll be able to resume your daily brushing and flossing regime 24 hours after the extraction. 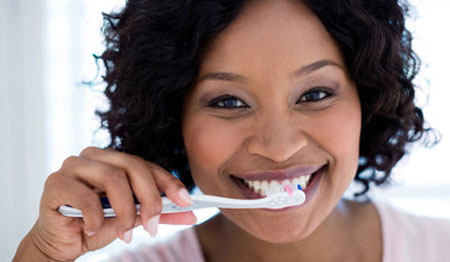 Be mindful of your dental work, but regular dental care will speed healing and help keep your mouth fresh and clean. In no time you will feel like yourself and back to normal activity. If any symptoms continue such as bleeding, pain or swelling for 2-3 days after treatment, or if you have a reaction to the medication, please call our office immediately. If any symptoms continue such as bleeding, pain or swelling for 2-3 days after treatment, or if you have a reaction to the medication, please call our office immediately.